SAN FRANCISCO, 2018-Feb-19 — /Travel PR News/ — Wine lovers rejoice! 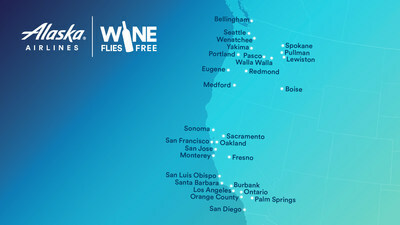 Alaska Airlines is expanding its wildly popular Wine Flies Free program all along the West Coast — enabling Mileage Plan members departing from cities in California, Oregon, Washington and Idaho to check an entire case of wine for free. To celebrate the program’s expansion, Alaska Airlines will offer a complimentary glass of wine to guests 21 and older on select flights on National Drink Wine Day this Sunday. With the expanded Wine Flies Free program, wine aficionados can now check their wine from an additional 18 cities, for a total of 29 on the West Coast. Alaska Airlines will be working closely with regional winegrowers’ associations, individual wineries and destination marketing organizations to promote the offering throughout wine regions along the West Coast. The Wine Flies Free program debuted in 2007 to make it easier for travelers to bring home their favorite bottles of wine from Santa Rosa/Sonoma County. Oftentimes, wineries are unable to ship cases of wine directly or consumers are faced with costly shipping fees to transport wine. Alaska Airlines’ Wine Flies Free solves these challenges by offering each Mileage Plan member the ability to check an entire case, up to 12 bottles of wine, for free. Travelers looking to take advantage of the Wine Flies Free program can sign up for a Mileage Plan membership for free. To prepare wines to fly, each bottle must be packed and sealed for transport in a protective shipping container. Alaska Airlines customer services agents will be available to work with each guest to ensure that their case of wine is properly labeled. This entry was posted in Airlines, Entertainment, Flights, Food & Drinks, Travel, Travel Marketing, Travel Services, Travelers and tagged Alaska Airlines, Natalie Bowman, West Coast, wine, Wine Flies Free program. Bookmark the permalink.